New Orleans is an exciting and friendly city with a truly unique culture. I spent five days there during the annual Jazz and Culture festival. I was met by kind locals who took southern hospitality to heart and wouldn’t balk at helping out a stranger. Even in the dingiest of dive bars where you’re greeted with a string of expletives, you could make yourself friends over a cold beer. Music is inescapable. It seems that every street corner and bar has their own group of musicians. The musical Mecca attracts endless talented musicians. It’s a hard city not to care about music in. From the Uber drivers to the baristas, the ability to talk about music, especially jazz, goes far beyond my own comprehension. It’s also a great city to eat in. Jazz Fest features booth after booth of traditional Cajun food. From alligator to red beans on rice, choices are endless and you need a solid week of gluttony to experience what they have to offer. Breakfast was a highlight for me. I frequented the Live Oak Cafe, a cozy little spot on Oak Street that served up one of the best breakfasts of my life. Musicians jam in a corner of the restaurant while you sip on a mimosa and wait for your food. From the traditional southern biscuits and gravy to huevos rancheros with a Cajun flare, it was a struggle to decide on just one plate. 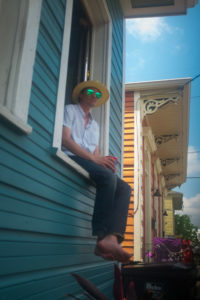 Drinking is another big part of the city, although drunken debauchery genuinely doesn’t define New Orleans. It’s more then that. The novelty of 24 hour bars and drive-thru daiquiri shops seems to have worn off for many of the locals who have grown up with it. A lot of the people I chatted with who migrated to New Orleans were either hardened drinkers or abstained from alcohol all together. You’re never too far from a bar and if you are then a corner store would be happy to provide you with a beer and a brown bag to go along with it for the walk. The people of New Orleans take pride in their city and living there. You can’t go far without seeing the phrase “NOLA” on something. I was slightly puzzled by it until I realized it stood for “New Orleans, Louisiana”. For me, a dive bar sums up the city well. It’s a dingy place with sidewalks that abruptly end, the occasional boarded up window and the feasible grim reality that nothing is too far from flooding. Despite all of this it’s full or colour, culture and friendly folks. Life is lived in the moment and the flaws are embraced. That’s what makes New Orleans great.